Along with the Resistance, with the release of the 2nd edition of X-Wing, Fantasy Flight created the New Order faction. No longer ust a portion of the old Imperial forces, they're their own faction on the tabletop. Of course, that means they need all sorts of new New Order only upgrades. In this preview, we get a look at some of those. The Empire is gone. The Star Wars galaxy has fallen into disorder. It is time for the First Order to rise and bring calm to the chaos fostered by the New Republic. But to do so, the First Order must first wipe out the loathsome Resistance. Flying into the tense space battles of X-Wing™ in modern starfighters based on Imperial designs, the pilots of the First Order are ready to display their fanatical devotion to the cause. Although the Galactic Empire’s influence is evident, the First Order has evolved into a separate entity in the years since the Battle of Endor and this break carries over into the new edition of X-Wing. As a separate faction, the First Order brings its own complement of starfighters to X-Wing, and veteran and new players alike can use the First Order Conversion Kitas a starting point for their First Order squadrons. 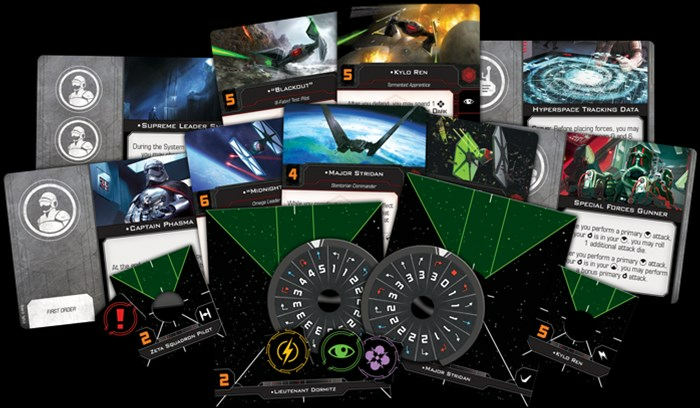 This kit contains a vast array of new ship cards and tokens—including iconic pilots like Kylo Ren—along with more than 100 upgrade cards that can be combined with the TIE/fo Fighter, TIE Silencer, Special Forces TIE, and Upsilon-class Shuttle miniatures from first edition expansions to create lethal First Order squadrons as soon as this kit is released in the fourth quarter of 2018. The First Order may fly newer versions of Imperial ships into battle, but this isn’t the only connection it shares with the Empire. Many members of the First Order’s chain of command can trace their roots directly to members of Empire and this new generation is eager to put their ruthless ambition to use in X-Wing. Today, we’ll take a look at how this ambition has been translated into the First Order’s exclusive upgrade cards!